Each pack in Route 11's range has a different color, but none relate to the flavor. This is strange because it is so easy to do. The two color shaker image really doesn't work. 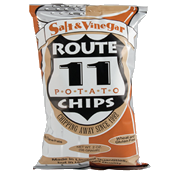 The big and bold Route 11 logo is however very good, but there is no need for it to dominate the bag - it isn't as important as the flavor. However, when you are building a brand it is wise to make the most of what you have. We prefer constructive criticism though, so to help Route 11 along, every flavor should have a place name along Route 11 in their title. Although it does not mention it on the packaging, these had a very Kettle Cooked feel about them. They were hard and crisp with a firm crunch that didn't see a few Chips at once quickly turn into mush. These Chips were thick and firm with an undulating surface texture that featured irregular shaped oil bubbles.The shapes of the Chips were similar - with bent, curled and wavy edged Chips. They were also a consistent light yellow color that looked fresh. A Nose Plunge Test revealed a tart but mild vinegar aroma. Salt & Vinegar as a Chips flavoring was invented in the UK in the 1950s to mimic the enjoyment the Brits got out of Fish & Chips. The secret to the flavor is a good balance between the Salt and the Vinegar. Many US versions of this flavor have a far too dominant Vinegar aspect to the pairing. These were much better balanced. The sodium content was relatively low, so the Vinegar extracts were not brought along as quickly as some saltier Chips manage to do. One of the better versions of this flavor on the US market.